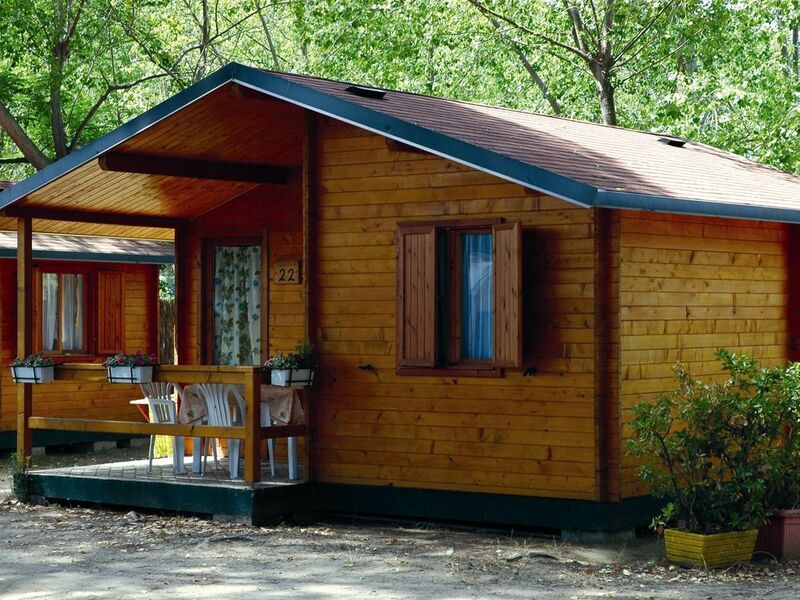 Viareggio, our wooden chalets in a beautiful location on the outskirts of camping Paradiso. The chalets are located on spacious plots and have their own parking place at the chalet. The format consists of a small living area and a kitchen, 4 burner stove and refrigerator. Furthermore, each chalet has a total of five fixed beds in two bedrooms and a bathroom with shower, sink and toilet. The chalets are fully furnished and equipped with TV and satellite dish. All wooden chalets have air conditioning. All chalets have a covered veranda with garden furniture. The chalets are blankets and pillows. Bed linen and towels please bring your own but are also for rent on the site for 15 euros per bed per change (indicating when booking). The park is beautifully situated in a wooded area and yet close to the city of Viareggio. The camp has about 450 sites that are located around a central "square". Around the "square" you will find a small supermarket, bar, restaurant, bike rental and a kiosk. There is camping with a playground and a swimming pool. From the campsite you can on foot, by bicycle or by car to visit the sand located state of Viareggio 1000 meters from the campsite. In the high season, however, runs a free shuttle bus from the campsite to the beach. From the Netherlands and Germany are daily (cheap) flights to Pisa. Pisa is located only 30 km from the site and therefore offers the possibility to visit in a short (for or autumn) holiday beautiful Tuscany. Viareggio is internationally known as a resort town on the Ligurian Sea. The grand hotels and cafes are characterized by Art Nouveau architecture and the port seems like a showcase for luxury yachts. The wide sandy beaches, cool ocean breezes and cozy beach bars, the beach is very pleasant life in this beloved child-friendly resort. Between the center of Viareggio and Lido di Camaiore is a 3-kilometer long promenade with shops of the famous clothing brands, terraces and the famous Italian gelateria. The shops are open till late in the evening. From Viareggio you can perfectly combine a beach holiday with fun cultural excursions. Visit the Puccini music festival in July and August at Torre del Lago Puccini, a village in the municipality of Viareggio. Want to see more of Tuscany than are the famous places of Lucca, Pisa and Siena nearby. For example, go with the family rent a quad bike to cycle about 4 km long city wall of Lucca! Pisa owes its fame of course the leaning tower on the famous Piazza dei Miracolio but Pisa also has one of the largest universities in Italy and is therefore a lively university town. Or a day to the provincial capital of Tuscany, Florence ... with the many museums, the beautiful center with the famous bridge from the film Perfume. Further north of Viareggio is Cinque Terre. It consists of 5 uniquely situated picturesque villages which can be visited only by train or by boat. A scenic hiking trail, the Via dell'Amore, connects the villages with each other. In the surroundings of Pisa is the amusement park Piccole Mondo built by family Fornaciai which has long experience in setting up amusement rides for children. They are proud that they have the highest slide of Tuscany. But there are more amusement parks such as Pinocchio Park in Collodi, the prehistoric park in Peccioli or the zoo in Pistoia.